Today I tried out two new forms of transport in Jerusalem. One is indeed new to the city – Jerusalem’s new light railway, which opened to the public ten days ago, after years of controversy and seemingly endless delays, and any number of questions about its positive or negative effect on Jerusalem transport and commerce. But since the light railway doesn’t come anywhere near our part of Jerusalem, first I took a bus to the center of town. Now, I may indeed drive a car and rarely take buses, but it’s not as rare an event as all that. What makes it noteworthy is that I took an Arab bus, one that has been more or less passing my front door for many years, but one I have never thought to make use of. It all started with a house-swap: my husband and I swapped houses for a couple of weeks this summer, exchanging our Jerusalem apartment for a cottage in the Correze district in France. When I returned home a few days ago, I found that my French visitor had left behind a map of the Arab bus lines. I’d never seen one before, and it made me think. A couple of weeks before I left for my holiday, one of my Palestinian friends remarked in passing that she never took Egged buses (the regular, “Jewish” lines that most Israelis use), because she doesn’t feel safe in them. I was astonished – such a possibility had never occurred to me. On the other hand, I am fully aware that there is a network of Arab buses running along the main road next to our house, that the vast majority of Israeli Jews barely notice, let alone ride on. The fact that our French visitor was questioned by the security guards at the airport about the Arab bus ticket in her wallet is an indication of just how separate the bus systems are. Armed with a bus map, I felt it was time to give it a go. When I got to my local bus stop, for the first time I examined it a little more carefully. On a separate sign (in Hebrew and Arabic), it listed two buses that I now knew to be Arab buses. When one came along, I got on, paid my (cheaper) fare, and sat down. Other than a couple of glances, possibly triggered by my sleeveless top, nobody seemed bothered by my presence. The bus moved quickly, as few people were getting on and off in the mainly Jewish areas we were passing. I reached the Jaffa Gate within 10 minutes (having told my French visitor that there was no direct bus to the Old City from our house!). A triumph! Now it was time to take the light railway. I wanted to take it in the direction that would take me through a mixture of Jewish and Palestinian neighborhoods. A young boy at the rail stop gave me leaflets with a map in Hebrew, and then in Arabic when I requested one (and on the way home I found one in English too). All the signage was in all 3 languages. I noticed that whereas the Hebrew version names Jewish neighborhoods, it ignores the existence of Palestinian neighbourhoods. Other than 3 stops in purely Palestinian areas, all other stops have Jewish names – such as “Shimon HaTzaddik,” right next to a municipality sign for the area called Sheikh Jarrach. The Arabic version of the map doesn’t include neighborhood names at all. 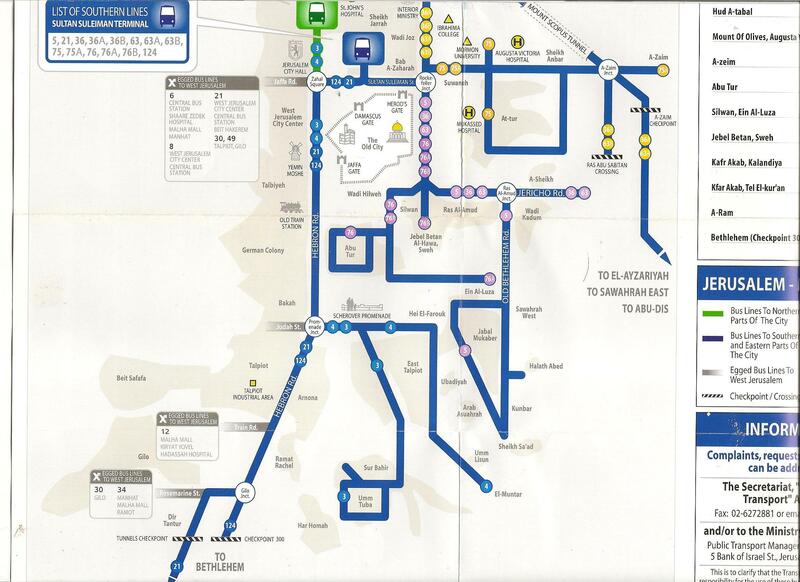 Likewise, the Hebrew version lists in great detail the bus routes that connect to the light railway system, but simply reads “East Jerusalem lines” at the relevant Palestinian stops. Putting all that to one side for a moment, and ignoring the frequent technical difficulties and delays, it was fascinating watching the interaction of people who are not used to rubbing shoulders in such a completely normal way. Jewish children staring wide-eyed as we entered a Palestinian neighborhood they have never been in, though they live two minutes away. A crowd of headscarved women, some Jewish and some Muslim. Tentative conversations breaking out over mutual complaints at the delays. On the whole the Jewish and Arab adults and children looked at each other with a degree of mutual suspicion and distrust. On the other hand, there was a moment of real coexistence when a couple of toddlers shared the universal language of Bamba, too young to have learned fear. Perhaps this new form of transport will create a point of contact, somewhere where Jews and Arabs can learn to see each other as normal human beings. On the way home I walk down to Jaffa Gate again to take a bus home. It’s a stop which doesn’t serve regular Egged buses, and there’s nowhere to sit and no shade. It’s hot. Only one bus seems to be listed, though my map suggests there should be another one. After quite a long wait, a mini-van bus approaches. I ask one of the young men waiting for it and he confirms that it goes past my house. I get on, and another young man insists on giving me his seat. This bus isn’t even listed on the Arab bus map but I’ve seen lots of them around. Once again, I feel perfectly comfortable, though I notice that in both directions I’ve chosen to speak English, leaving open the question as to whether I’m Israeli or a tourist. I don’t know whether the Palestinians riding their separate bus system would welcome me using their buses – would it be taken as a sign of coexistence and tolerance or a sign of oppression and occupation? I don’t know. All I know is that the separate systems have been created because of our underlying fear of each other. I’m by no means impervious to fear, just willing to put it aside in order to push the boundaries a little. I believe that only by overcoming some of our fears can we learn to inhabit the same public space and live alongside one another in the city we must learn to share. « What do we want? Something! When do we want it? Now! Fascinating insights into a divided society. A place where public buses have religions and ethnic identities, even though there are no apartheid-style rules restricting access to anyone. Are there forums where maps which exclude the names of one part of the population (and one part of the potential customer base) can be challenged? That would be a very small but positive step to co-existence. Very interesting article. I have been in israel for the past 5 weeks working with Peace Now whereby I feel the greatest lesson I learnt was gaining a greater understanding of the Israeli psyche while occasionally gaining glimpses of the Palestinian mindset. To me, there is a genuine fear among Israelis of any hope of peace – something which I can completely understand given the modern State of Israel’s turbulent history. This however only leads to a greater divide between both camps and continued distrust as you said. Although it is often an easy argument to make, the situation is not helped by the fact that both governments continue to blame the other side by deeming them as unsuitable partners in peace. I have experienced this first hand as I have been able to meet government officials on both sides who often take the easy route and deem ‘the others’ as those in the wrong. It takes real courage from political leaders to embrace the other; personally I feel Yitzhak Rabin was one of the last to really do that when he officially recognised the PLO as the sole representative of the Palestinians. However, until that day comes, I applaud you on taking small steps like taking a Palestinian bus and breaking down the divide between Israelis and Palestinians and conquering the fear that both sides have of one another. Keep up the good work and keep up the nice writing.